Terrible Tim Witherspoon came out of South Philly and made his first noise as a 15-0 heavyweight with a well fought and close decision loss to champion Larry Holmes in 1983. A year later he took a share of the world crown with a win over Greg Page. But Tim was an inconsistent fighter with so-so training habits - characteristics that would plague him throughout his career. He lost his title in his first defense but went on to win WBA honors on 1986 vs. Tony Tubbs. 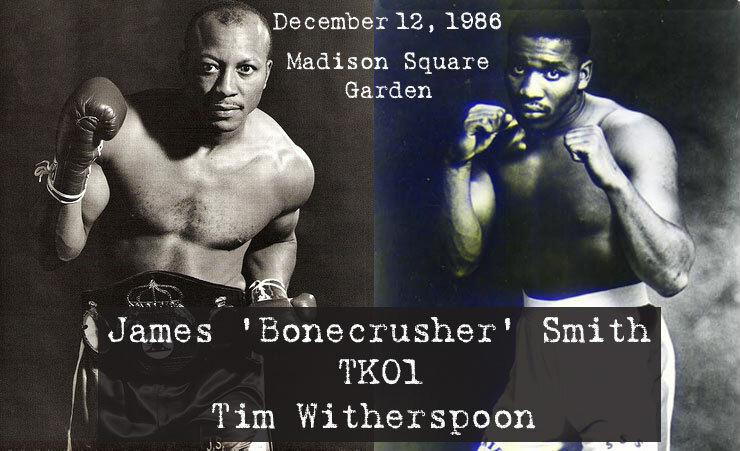 After one defense, Tim lost the belt to James Smith on this day in 1986. Three knockdowns in the very first round by Smith won him the title and reversed a previous decision loss to Witherspoon. With the victory, it was Smith who would advance to the financial bonanza of a unification fight with the rising Mike Tyson.